Drawing on the thought of Durkheim, this volume focuses on societal changes at the symbolic level to develop a new conceptualisation of the emergence of postsecular societies. 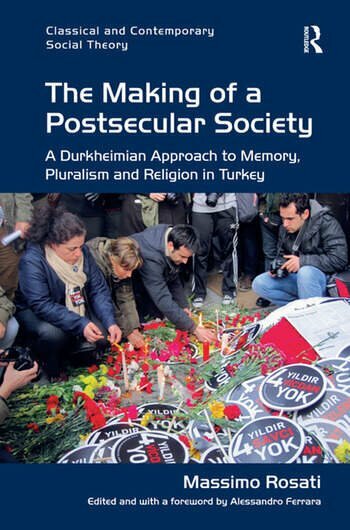 Neo-Durkheimian categories are applied to the case of Turkey, which in recent years has shifted from a strong Republican and Kemalist view of secularism to a more Anglo-Saxon perspective. Turkish society thus constitutes an interesting case that blurs modernist distinctions between the secular and the religious and which could be described as ’postsecular’. Presenting three symbolic case studies - the enduring image of the founder of the Republic AtatÃ¼rk, the contested site of Ayasofia, and the remembering and commemoration of the murdered journalist Hrant Dink - The Making of a Postsecular Society analyses the cultural relationship that the modern Republic has always had with Europe, considering the possible implications of the Turkish model of secularism for a specifically European self-understanding of modernity. Based on a rigorous construction of theoretical categories and on a close scrutiny of the common challenges confronting Europe and its Turkish neighbour long considered ’other’ with regard to the accommodation of religious difference, this book sheds light on the possibilities for Europe to find new ways of arranging the relationship between the secular and the religious. As such, it will appeal to scholars of social theory, the sociology of religion, secularisation and religious difference, and social change. Massimo Rosati was Associate Professor of Sociology and the founder and first Director of the Centre for the Study and Documentation of Religions and Political Institutions in Post-Secular Society at the University of Rome ’Tor Vergata’, Italy. He was the author of Ritual and the Sacred: A Neo-Durkheimian Analysis of Politics, Religion and the Self and co-editor of Suffering and Evil: The Durkheimian Legacy, and Multiple Modernities and Postsecular Societies. Alessandro Ferrara is Professor of Political Philosophy and Director of the Centre for the Study and Documentation of Religions and Political Institutions in Post-Secular Society at the University of Rome ’Tor Vergata’, Italy. Former President of the Italian Association for Political Philosophy, he has recently authored The Democratic Horizon. Hyperpluralism and the Renewal of Political Liberalism.